Do you like Dewberry? I like "Dewberry Blue" (blueberry) while the kids like "Dewberry Red" (strawberry). 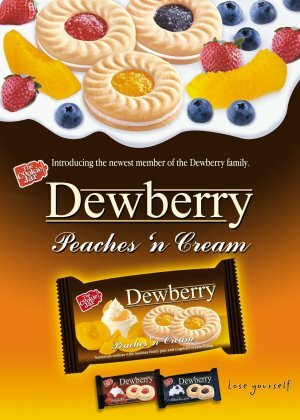 They now have another yummy variant: Dewberry Peaches 'n Cream (by Universal Robina Corporation (URC). Check it out today! Introducing the newest member of the Dewberry Family� Dewberry Peaches and Cream. Lose yourself in the goodness of sweet, smooth, luscious cream-filling and tangy peach jam matched with perfectly baked cookies that are mouthwateringly delicious. One is definitely not enough.